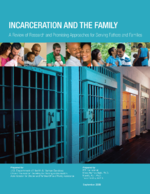 Although a high percentage of incarcerated fathers are of ethnic minorities, very few family strengthening programs in prison or surrounding reentry have been designed with cultural issues in mind. Those programs that have addressed culture have reported positive reactions from participants. For instance, one program uses discussion of family traditions and rituals, and videos and literature depicting different cultural groups, in order to make sure that program content resonates with a variety of fathers (Palm, 2001). Another program found it helpful to hire a facilitator of the same ethnicity as the participants (LaRosa & Rank, 2001). The implications of these efforts for program success have not been evaluated, and there is little theoretical development to guide research testing the impact of culturally relevant program content on inmate outcomes. In the future, programs that aim to strengthen partner and father-child relationships need to be sensitive to cultural differences in family relationship definitions, expectations, and behaviors (Adalist-Estrin, 1994; Bauer et al., 2007; Meek, 2007; Palm, 2001). Qualitative research could aim to identify programmatic approaches and activities that would be culturally relevant and acceptable among different groups. Using this information, programs could be tailored to the diversity of prison populations, and evaluation of these programs would be necessary to test their effectiveness.